Brazilian independent oil firm PetroRio SA, which already owns 70 percent of the Frade oil field, has approached Petrobras about buying its 30 percent stake in the field, a person familiar with the matter said. PetroRio recently signed a deal to buy Chevron Corp's majority stake in the mature deepwater oil field. PetroRio, seeking more flexibility to pursue the Petrobras transaction and other upcoming deals, struck an agreement with Chevron for a deferred payment scheme in return for its stake in the field, said the person, who requested anonymity to discuss internal matters. The value of PetroRio's deal with Chevron has not been disclosed. PetroRio, based in Rio de Janeiro, last year bought an 18.3 percent stake in the Frade field. It said on Wednesday it had agreed to purchase Chevron's majority stake in the field, located in the Campos basin off the coast of Rio de Janeiro state. This deal brought PetroRio's total oil production to 28,000 barrels of oil per day. The company, which specializes in acquiring stakes in mature fields and boosting their productivity, now owns 70 percent of Frade. It said its stake there accounts for about 15,000 barrels of oil equivalent per day (bpoed) production. The structure of the purchase will allow PetroRio to pay Chevron in large part using revenue from Frade, the person said. That will help the firm pursue further acquisitions, such as the Petrobras stake. PetroRio, Petrobras and Chevron did not return calls seeking comment. Petrobras (Petroleo Brasileiro SA) is divesting its stake in many producing fields to focus on an area deep under the ocean floor where billions of barrels of oil are struck underneath a layer of salt. PetroRio, meanwhile, is attempting to gobble up stakes in the relatively mature fields that Petrobras and other international oil companies are exiting. 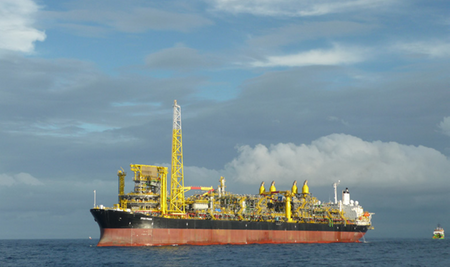 Among the Petrobras assets that PetroRio has bid for, Reuters reported in January, is the Petrobras shallow-water Bauna field, which produces about 34,000 bpoed.